Close protection agents, especially female, are highly sought after in China. They are inconspicuous and can keep a low profile that gives many VIPs a sense of security without the overbearing presence of traditional muscle-men security guards. Today, private or state-owned corporations and agencies from China are active in every corner of the globe, from Afghanistan in the east to Zimbabwe in Africa stretching to Colombia and Brazil in South America. The security of Chinese citizens abroad is increasingly a national security issue for China. This was best demonstrated by the evacuation of Chinese and foreign citizens from war-torn Libya and Yemen in 2011 and 2015. To augment the state protection, the Chinese have been developing a private security industry, much of this under the radar screen, until exposed by a recent Financial Times article. According to the FT, there are currently some 3200 plus Chinese “Private Security Agents” (PSA) working abroad, many of whom are veterans of the People’s Liberation Army (PLA) or the People’s Armed Police (PAP). Their work can be far ranging, anything from anti-piracy protection for merchant vessels in the Gulf of Hormuz to protecting copper mines in Afghanistan. Many of these PSA are unarmed but they do work with local gun carrying “security companies” should armed intervention be required. The Chinese have been venturing abroad as early as the 1990s and the need for protection in dangerous places is nothing new. In the early days before the establishment of the Chinese PSA, these Chinese firms had to make do with western PSA. My ex-school mate from England, an ex-Army man himself, was hired for just such a mission in Sudan to de-mine under the contract to a Chinese oil prospector. According to a Chinese website SohuNews.com, since 2013 there had been over 86,000 people having enrolled and passed out from some sort of PSA training one way or another. Many of them work in China, ranging from VIP high net-worth individual protection to more mundane job like event or site security. 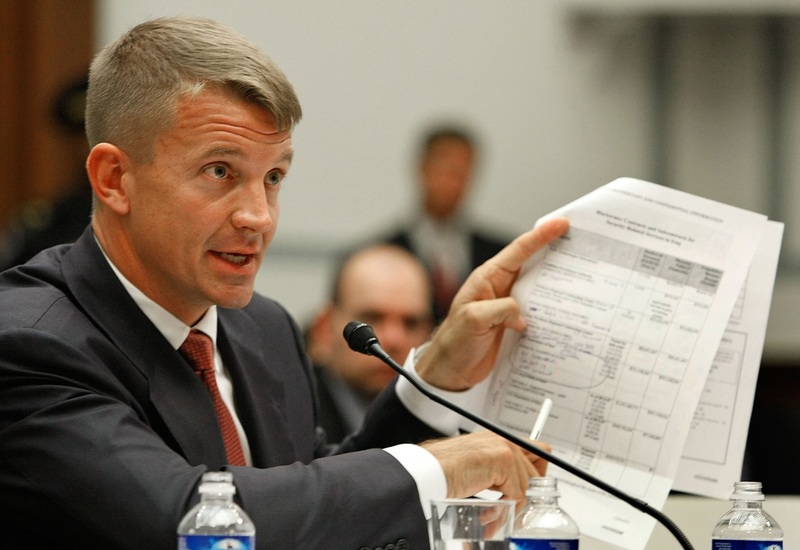 Erik Prince, then still the CEO of Blackwater, was defending himself in Capitol Hill against the accusation of excessive action by his men in Iraq. The motivation for Beijing is to allow the protection of its citizens and assets abroad without resorting to an “imperialistic” foreign policy. This analysis is confirmed by an interview with a former member of the PLA who was working as a PSA, who said that “there is a tremendous need for security overseas, but the use of the PLA may bring undesirable foreign policy consequences”. The attractiveness of the market is now luring western security contractors into the game. According to Buzzfeed, former Navy SEAL, Erik Prince, the founder of Blackwater (now renamed to Academi, a private military contractor that made its name in Iraq) is supposed to have been in discussion with the Chinese government to set up two private military training camps in China, most likely in SW China Yunnan and Xinjiang in the western desert. This will take place under the auspices of Frontier Services Group (FSG), a HK-listed company (SEHK: 00500, www.fsgroup.com) that deals in “Security and logistics services in frontier markets” where Prince is the Executive Chairman. This report was strongly rebutted by the company spokesman claiming that all “security services formed by FSG were unarmed and therefore had no need to be regulated”. However, this may not be as innocent as it is claimed, for the CEO Gregg Smith, and retired US Admiral William Fallon, both resigned from the board in protest. Private Security Agencies were only possible in China after the deregulation in 2010 that allowed private individuals to provide security protection, which previously was the domain of the Police. However, this deregulation is only partial as demonstrated by GS4 the famous British private security firm. their business in China is still very much restricted and held back because the 2010 privatisation was only limited to Chinese individuals and corporations. As of today >90% of the private security work in China is still under the domain of Chinese Private Security Agents, many of which were set up by retired Police officers. Very little work is offered to foreign contractors. I think Erik’s ego has got the better of him once again as Xinjiang in Western China is an Uyghur Muslim area. Not only is it politically sensitive, but it is where China keeps many of its ballistic missiles and secret military bases. Granting a travel permit for a foreigner to this area is hard enough, never mind for an ex-Navy SEAL, and a man with CIA connections to conduct “security” training in such a sensitive area. Either he is ill informed or there are ulterior motives behind this.